Stoke have rejected a £1.5m bid from Norwich for forward Jon Walters. The 31-year-old has scored 50 goals in 214 appearances for the Potters since being signed from Norwich's East Anglian rivals Ipswich Town in 2010. Walters, capped 33 times by the Republic of Ireland, is entering the final year of his contract at the Britannia Stadium. He may play against the Canaries for Stoke in Saturday's Premier League game between the two sides at Carrow Road. 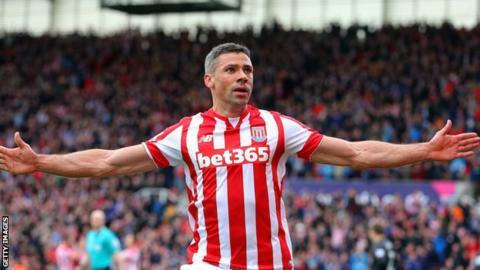 Birkenhead-born Jonathan Walters, who was on the books of nine other clubs before signing for Stoke City in August 2010, has scored almost half his career tally of 105 goals at the club. Meanwhile, Swiss winger Xherdan Shaqiri will be in the Potters' squad following his club record £12m move from Inter Milan. Boss Mark Hughes told BBC Radio Stoke he was already fitting in well at the Britannia Stadium. "He's an engaging fellow, who's always got a smile on his face," he said. "You can tell by the way he trains that he absolutely loves football. His joy for the game shines though and he's got a great end product. You need game changers at Premier League level, players who can pick the lock." Shaqiri was suspended for last weekend's 2-2 draw with Spurs at White Hart Lane because of a punishment held over from the end of last season.